Over on the feature table, Tuomo Niskanen was spotted leaving his seat, the cards still tabled with :::8c:::7d. 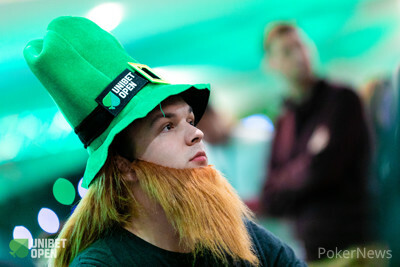 Unibet Poker ambassador David Lappin had flopped a full house with :::As:::Qd on the board :::Ac:::Qh:::Qs:::Kd:::2h and Niskanen then walked over to the table of Kasper Mellanen and Dara O’Kearney. "We talked about it before, I was sure I’d bluff my chips off with a triple barrel bluff," the Finn joked.